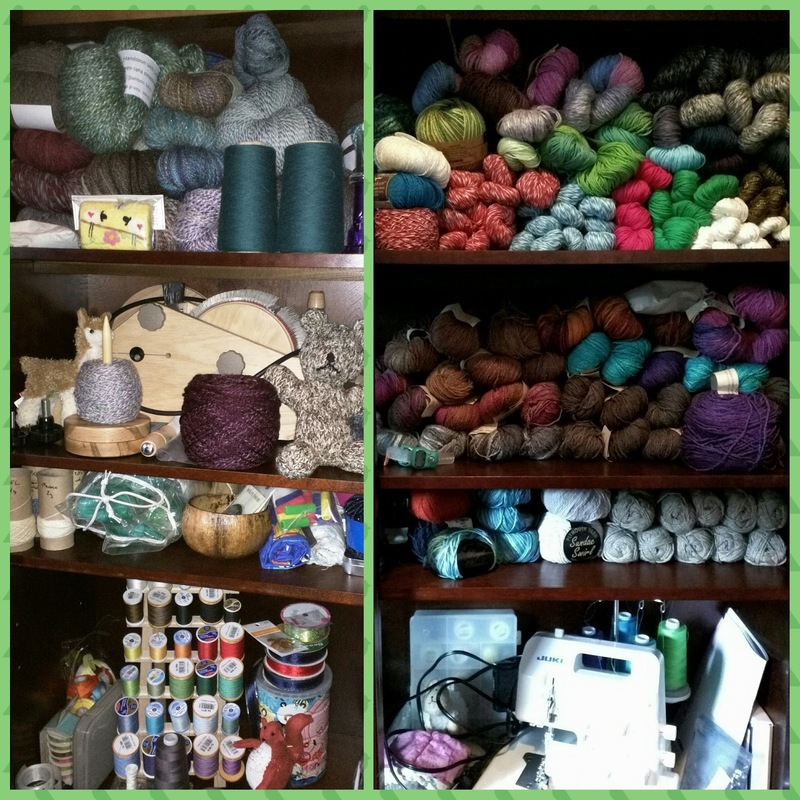 Yes, the cabinet I once hoped would hold my entire yarn stash now holds all of it plus my drum carder, serger and some sewing supplies too! I love my new smaller stash. 😄 There's still plenty to play around with and be inspired by, but not so much that it feels overwhelming anymore. 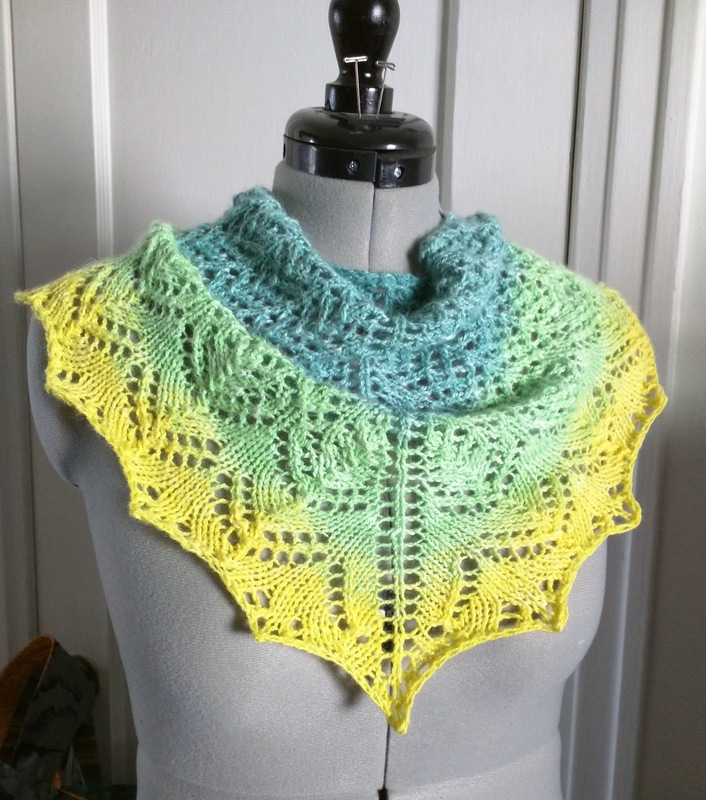 This was a great choice for knitting while distracted by the various Olympic events. Simple to keep track of where I was but not so simple that I got completely bored of it. Details here. This was my first experience with faux cashmere. Not bad, but I won't be buying any more. Faux cashmere is nylon and I'm trying to stick with just natural, plant-based yarns and fiber from here on. This braid had been in my stash awhile though so I'm glad it has finally reached its potential. It sat in my stash since 2013 but its journey from fluff to shawl? Five days. 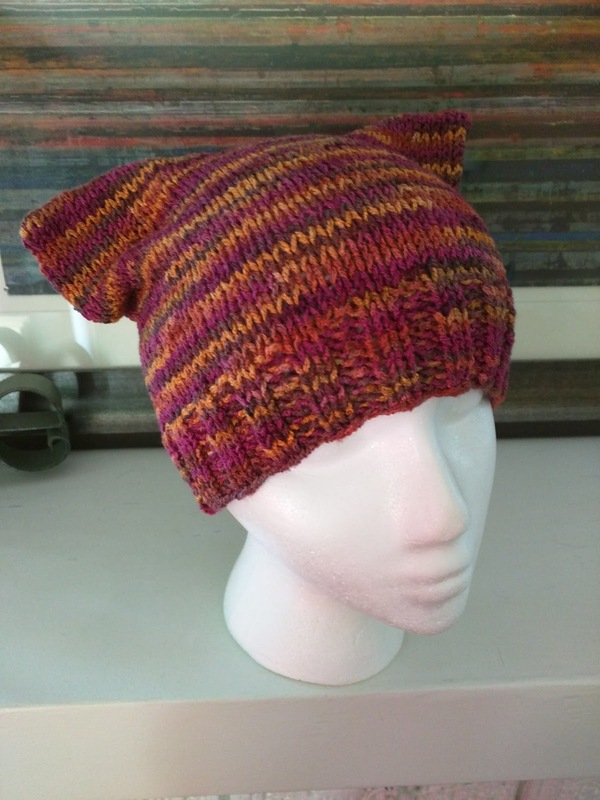 (Info on the pattern and fiber can be found here.) Be warned, there is an error in the written directions for this shawlette. I've noted the correction on my project page and let the designer know, but it doesn't appear that the file has been corrected yet. Super simple and quick! (Info here.) And with that, my 2016 Ravellenics Games were complete. I'm past the halfway point now and the rows are finally getting shorter! 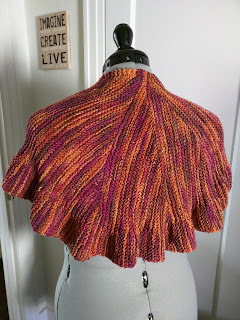 This will likely be the first of my donation shawls for 2017. (Pattern/yarn info here.) Another warning here, the shawl is quite simple to knit. The most difficult part about this shawl is deciphering the pattern instructions. The written instructions aren't incredibly clear and the charts aren't completely accurate. Between the two though, you can get the gist of it and as long as it's close, no one would know anyway. 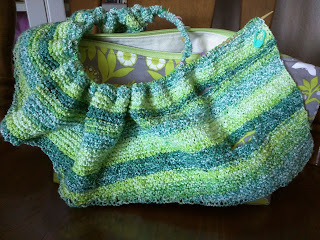 Garter stitch is forgiving! I may eventually make another from this pattern to keep. 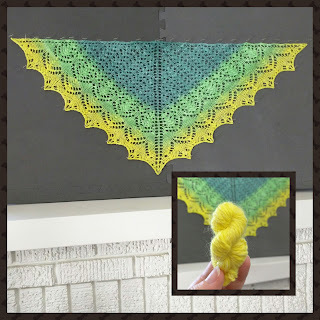 Craft what makes you happy! 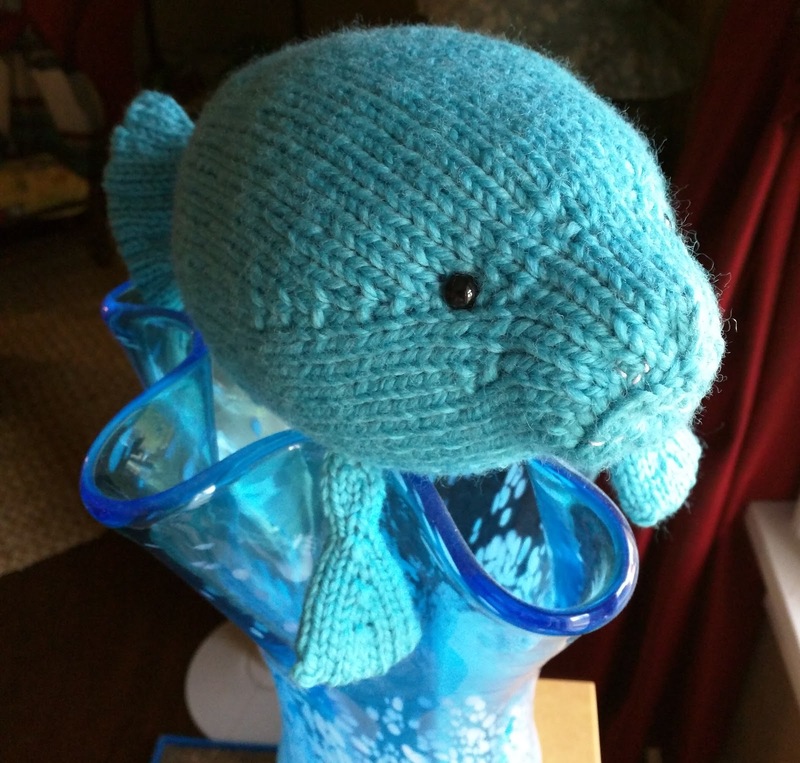 For the past few years, Sheila and Wendy, of the Knit1,HeartToo! 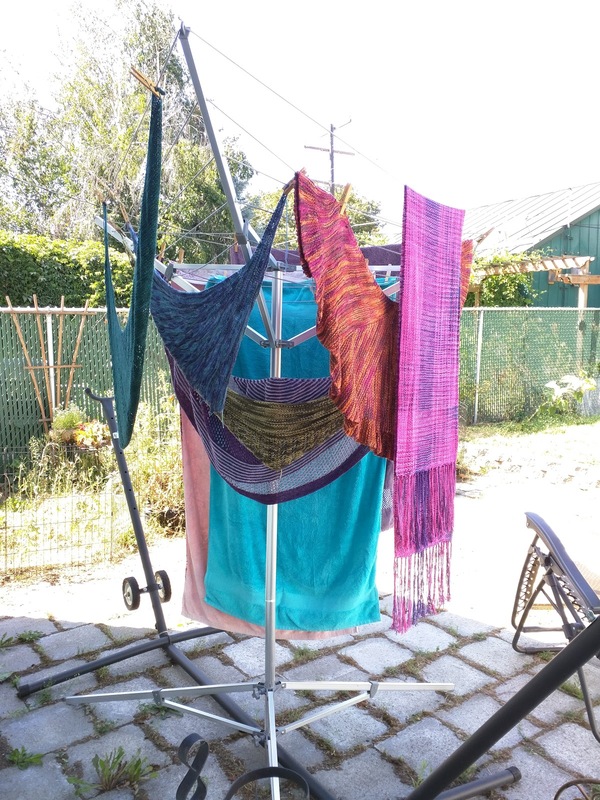 podcast have helped a local (to them) group collect shawls for a comfort shawl program. 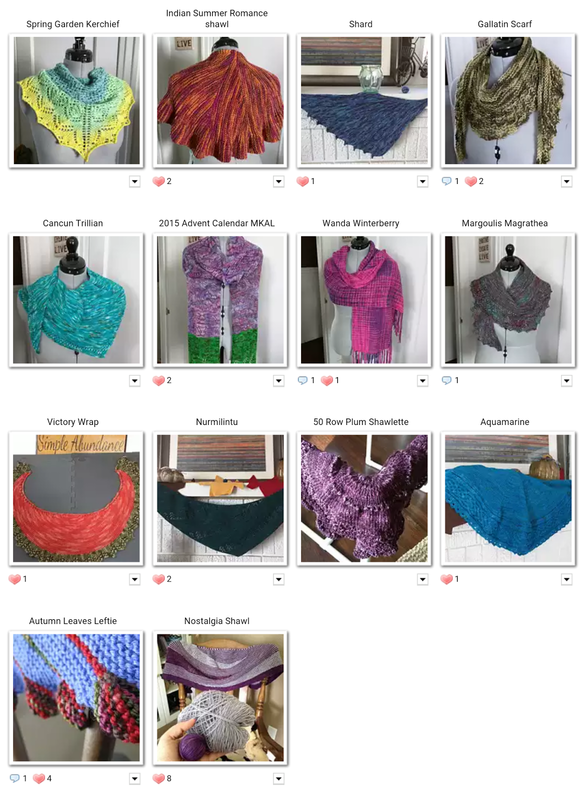 Last year, I was able to send a few shawls, but I set myself a goal of a dozen for this year. Though my knitting mojo has waned this year, I've also been reducing the things I hold on to and this year? I was able to send a whopping 14! 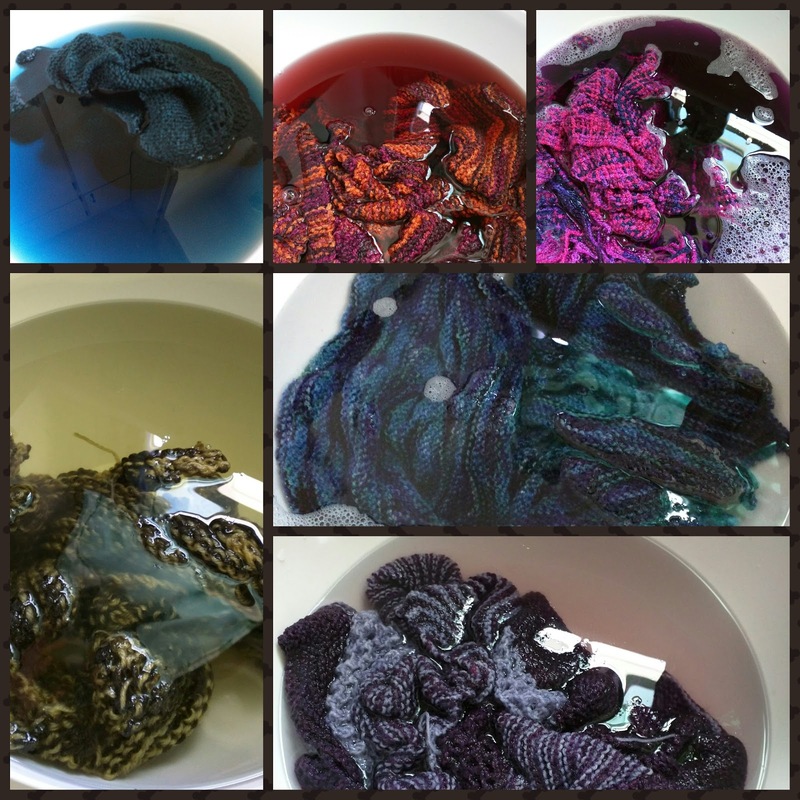 The charity accepts not only new shawls, but gently used shawls as well and of any fiber content. Most charities I've come across require acrylics and I'm not a fan of working with acrylic. This opens up the possibilities immensely! I do label all my shawls with fiber content and care instructions in case there are any allergies. I did a quick search online for free printable labels. I've made up my own in the past, but this year I used the ones found here (KnitPicks). Getting them ready to pack up, I gave all of them a bath that hadn't already been done. Need a reason to always wash a shawl by itself the first time? So. Much. Bleeding. 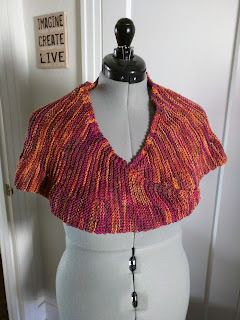 Happily the shawl made from a skein I dyed... didn't bleed. =) Another happy moment? 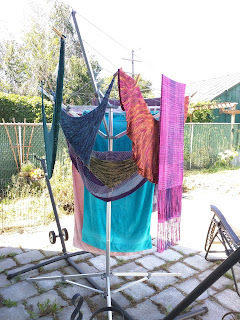 Realizing all but one of the shawls I needed to wash could be hung out on my clothesline to dry rather than being pinned out to block which meant they all got washed and dried in a single day. Here they all are! If you're interested in more info on patterns/yarns used, see my Ravelry page and click on the specific project you're interested in for details. Do you have any unloved shawls hiding in your closet? Or do you love making them but have already gifted them to all your knitworthy friends/family? Find a local charity to donate them or you can send them off to the group I did. Info can be found here. I'm aiming for another dozen next year! 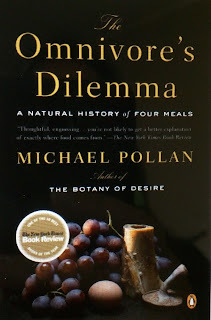 Awhile back, at long last, I finished reading Michael Pollan's The Omnivore's Dilemma. 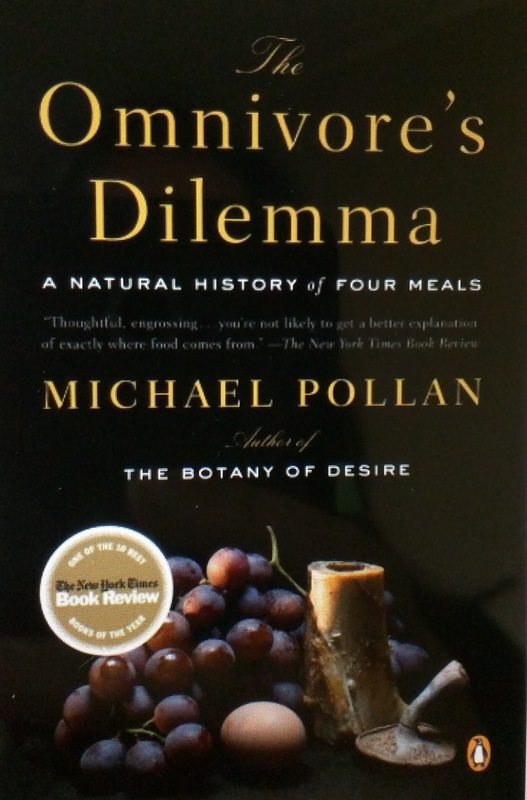 While I haven't been an omnivore in decades, it was in any case a very interesting read and one I'd recommend to anyone no matter what your diet currently looks like. 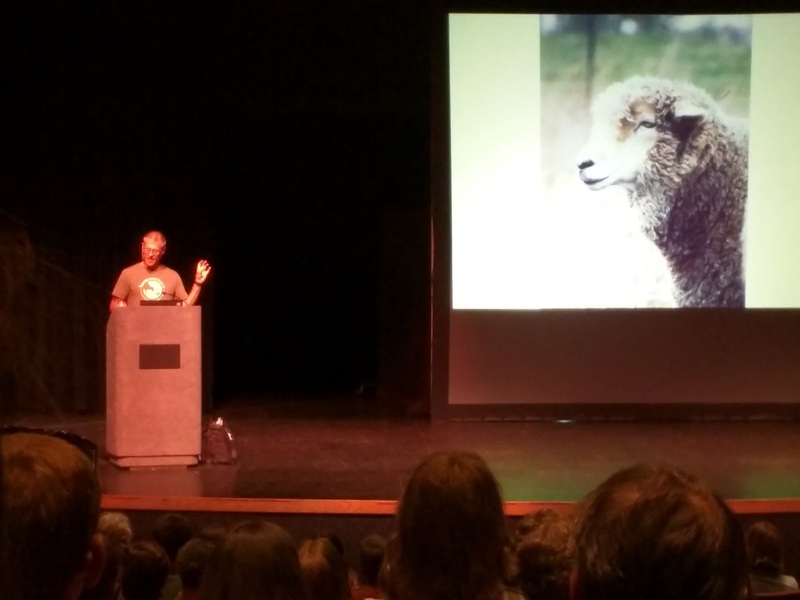 Pollan follows 4 meals through our food chain and sheds light on areas of "food" production many of us would like to ignore. While he doesn't advocate a wholly vegan, or even vegetarian, diet, he does, in my opinion, make a strong case for at least cutting back meat and animal products in our diets and also shares why free range or pasture raised animals are healthier for both the environment and our bodies if we do choose to consume animal products. 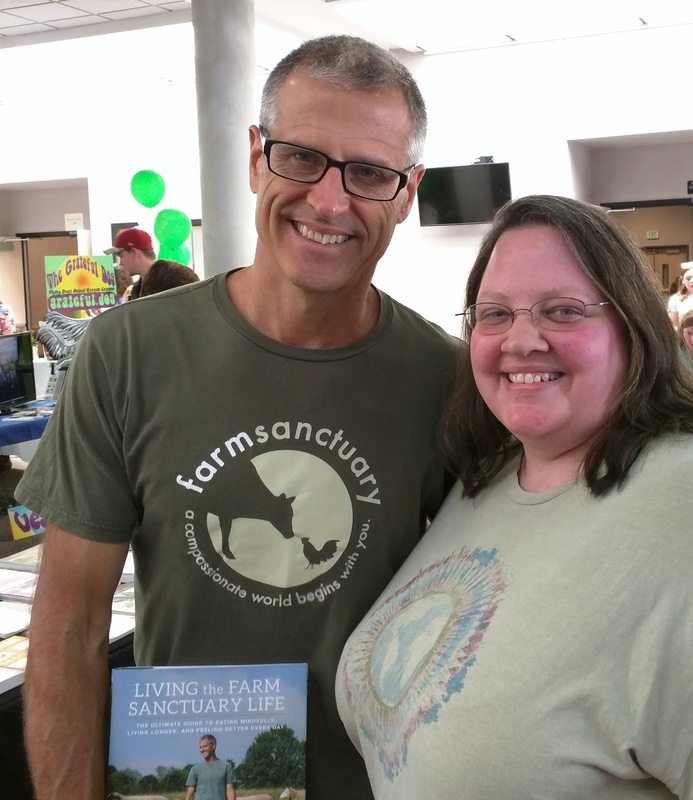 I do see his point in the symbiotic relationship between thoughtful animal farming and organic crop farming, but he didn't convince me to start eating dairy or eggs and there certainly won't be a steak on my plate! There are still animal products entering my home in the form of pet food however. While I know there are vegan cat foods on the market, cats are obligate carnivores and I don't feel I should mess with nature, but I can try to source their food as humanely as possible. 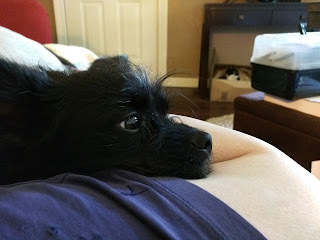 I have been seriously contemplating making my own dog food for awhile now. I've tried a vegan commercial food in the past but Reilly, my older dog, has issues with some grains so it didn't go well. I've purchased the supplements necessary to try making my own vegan dog food. Making it myself, I'll be able to choose the ingredients and hopefully avoid whatever Reilly reacted to in the commercial food. It'll be more work than opening a bag of kibble, but definitely worth the effort! Pollan discusses the prevalence of food-like substances in our diets as well. As our food system has become more and more processed, we've lost much of the natural state of foods. Reading labels these days practically requires a biology degree. Simplifying our diets and using mostly whole foods we cook ourselves eliminates the need for label reading though. BTW, it's also good for the wallet! ;-) Since I've switched to shopping from the bulk bins, I've cut out most highly processed foods. Sure, there are still items in the bins with more than one or two ingredients, but a quick glance through the list will make it obvious if there's real food in that bin. I'm lucky to have a local co-op along with a few other options for organic produce and bulk foods. Though companies continue to mess with natural foods and make eating more "convenient" for us, it is ultimately our choice and responsibility to know what we're putting into our bodies and what practices we are supporting with our dollars. Organic or free range may cost a bit more than conventionally grown/raised products when compared head to head, but isn't that worth it to not subject the farmer to the pesticides or the animals to a short, miserable life in deplorable conditions? Though I choose organic and local foods whenever possible, overall my grocery budget is down now that I avoid the highly processed, convenience foods. That's a big win in my book! How about a little simple inspiration on this fine Friday? I've watched a couple of great documentaries recently on simplifying and cutting back. It's well worth a watch! A group of strangers come together and attempt to live with a more positive environmental impact. While not everyone wants to downsize this drastically or live in a mud hut, I think we can all be more conscious of the impact of our daily decisions. I've been reading The Minimalists blog for quite awhile and also enjoy their podcast. This documentary is a compilation of interviews they did with people from all walks of life, living their own brands of minimalism. I think a lot of people have a certain image of what a minimalist is, but in reality, minimalism looks different for everyone. You don't have to live with just 100 things or have only 33 items in your wardrobe. It's about simplifying your life and removing the excess so that you can focus on what's truly important to you. The video is available on Vimeo right now, but if that doesn't work for you, they do say it'll be available on other platforms at some point in the future so keep an eye out for it! I've been thinking more about where my crafting materials come from. I have been for awhile. I've already reigned in my fabric acquisitions to better align with my beliefs. I decided to only add secondhand fabrics with maybe an occasional organic cotton or linen purchase and it's probably been a year since I purchased anything but secondhand. But what about my other crafts? Last month was kind of a turning point for me. Spokane hosted its third annual Vegfest and I experienced my very first. 😄 These are my people! I wasn't super interested in the various booths, but the speakers were so inspiring! I transitioned to a vegetarian diet when I was around 11 or 12, but have been eating a mostly vegan diet the past few years. I make my own nondairy milk (and ice cream!) and have plenty of options for replacing eggs when baking and even make a darn good tofu scramble. I have been using local honey the past year or so in an effort to limit my use of cane sugar (the industry is very environmentally taxing), so not totally vegan, but close. I did say I had a lot! I decided this needed to be a quicker process than trying to sell off individual skeins so after some thought, I packed up boxes to sell as lots at what I thought was a very good price for the buyer and would hopefully make it a quicker process for me... and oh my was it quick! Did I get back all the money I'd spent over the years? Not even close! 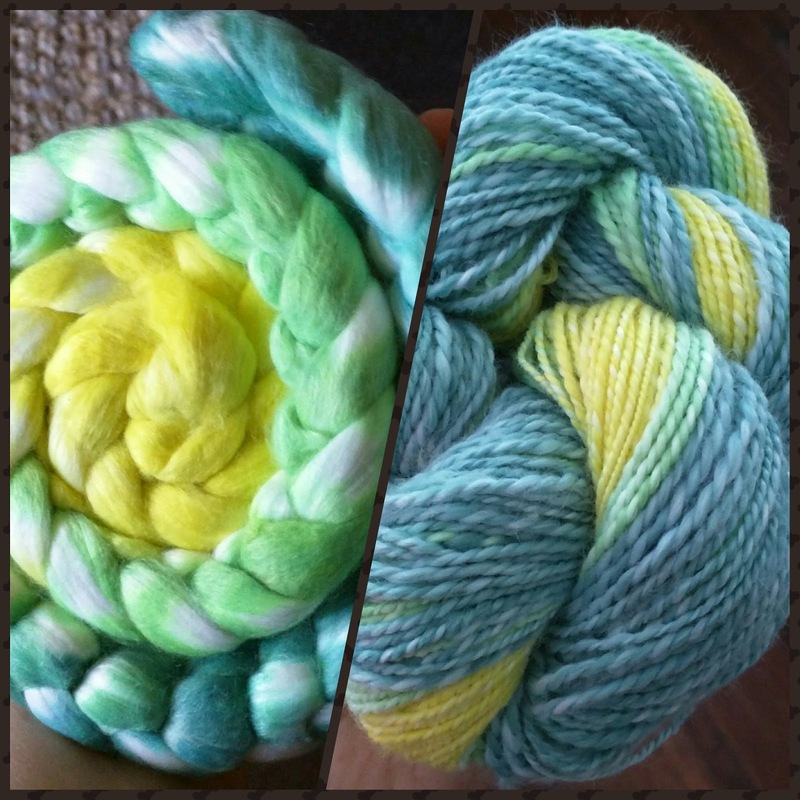 But these yarns are now in the hands of crafters who will put them to use and they're not here making me feel guilty over past decisions. I'm not telling you that your values should fall in with mine. We all make our own decisions and need to be at peace with our actions. 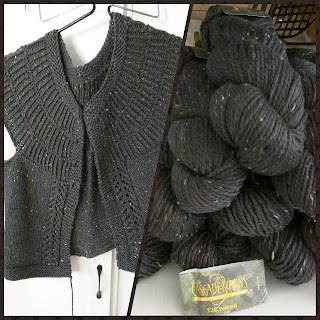 Someday, I may be ready to let my woolly handspun go too, but today is not that day. Baby steps (and sometimes giant leaps)! July ended with a heat wave... we are all waiting for Fall! But for now, another month has passed and time for a crafty update! And yes, both have pockets. 😀 Perfect for the receipt or whatever. 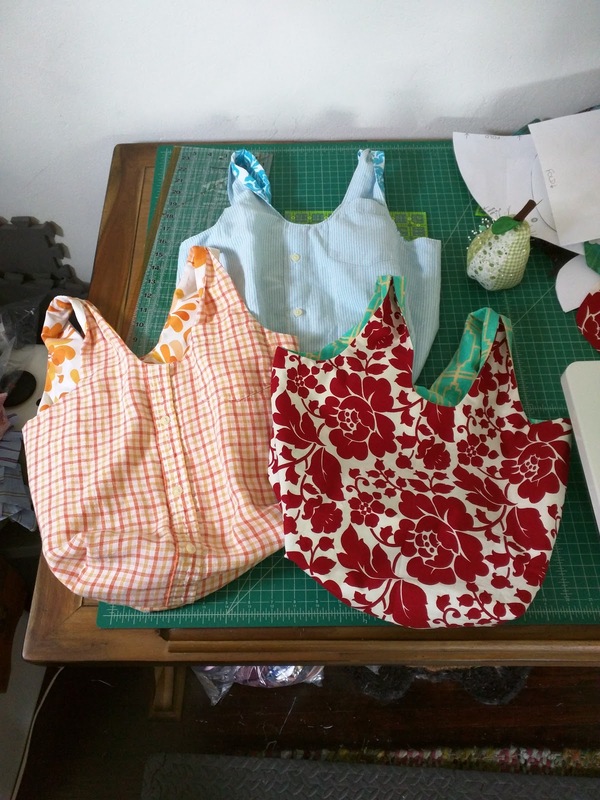 The interior fabric and both fabrics for the red bag were also secondhand fabrics. It just took a couple small adjustments to use the shirts for the exteriors. They're super comfy to carry when full and are surprisingly roomy. 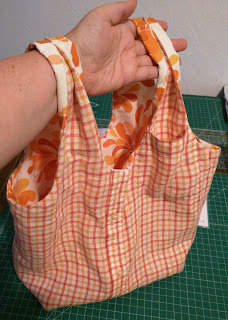 I actually used my old store bought bags when I decluttered my kitchen and donated the bags too. I'm seriously thinking of making some of these to sell. They're so fun! But wait, don't I still knit? Knit designer Rachel Borello Carroll designed a set of sea creatures and this was the first... an adorable manatee! 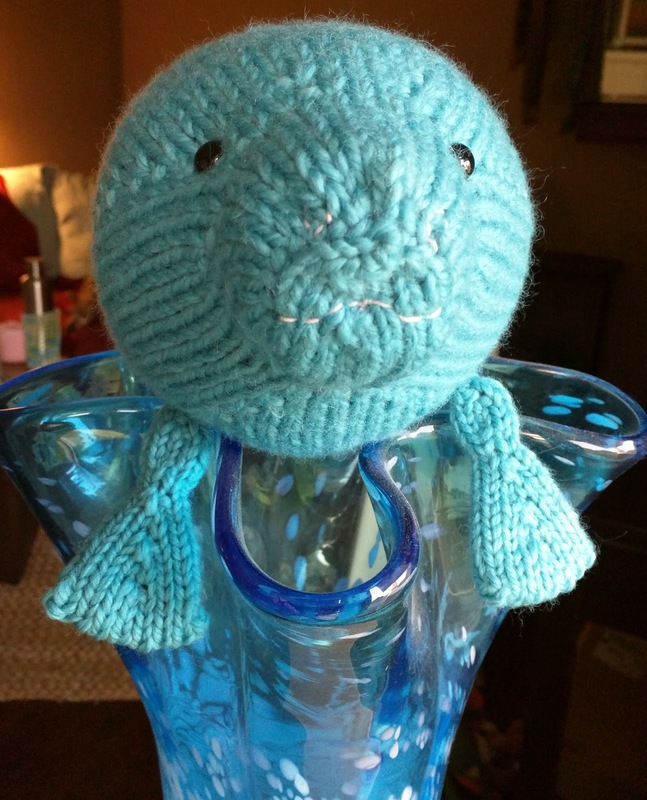 I used bulky yarn for an bigger stuffy and ended up with this football-sized critter. So cute! Not sure when I'll be makin the others, but I'm sure they'll come eventually.